Halo 5: Guardians Limited Edition case. 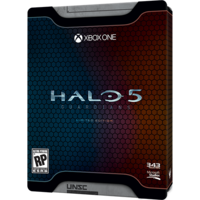 The Halo 5: Guardians Limited Edition is a limited edition of Halo 5: Guardians which costs $99.99 USD at time of release. It contains additional content not found in the standard edition. An additional Halo 5: Guardians Limited Collector's Edition features all of the contents of the Limited Edition as well as a commemorative statue of John-117 and Jameson Locke. The contents of the Limited Edition.